Stress Fractures in runners are common. But they’re are some things doctors can do differently to help runners run sooner. 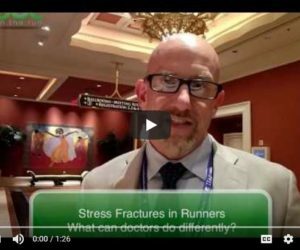 Dr. Christopher Segler was just lecturing to a group of physicians at the International Foot & Ankle Foundation meeting in Las Vegas where he was teaching doctors some of his tricks to healing stress fractures in runners. Here are two main takeaways for an injured runner who wants to run sooner when healing a stress fracture.